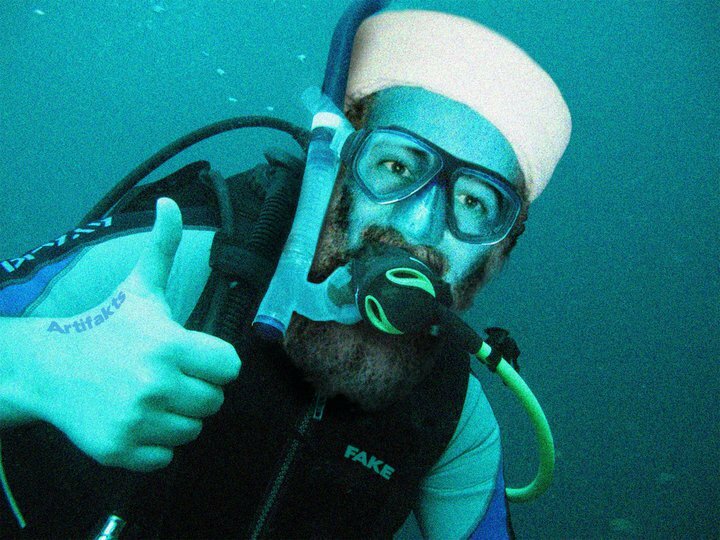 Did Osama bin Laden Rise from the Dead? And how about the other guy with the beard? A response to Ex Christian. Five days ago, American Navy Seals landed near a brick-walled compound an hour's drive from Islamabad, ran upstairs, and shot Osama bin Laden in the head. They then flew out to sea in a helicopter and tossed his body into the salty brine. He is now, some commentators noted, "swimming with the fishes." But is he? Is it possible that on the third day, Allah breathed new life into his lungs? Might it be that, with his new "resurrection body," he is even now dining on fresh sushi and gambiting in the surf with dolphins -- or perhaps staging an amphibius return to terror prominence? 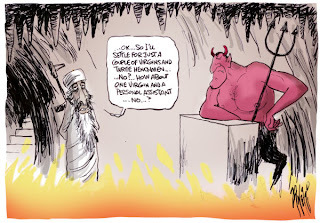 Or is Osama, as the cartoon to the right suggests, now in a place hotter and drier even than Pakistan? There are, of course, other options. From a Buddhist perspective, one might imagine his life essence entering the body of a slug that slithers painfully across a damp rock in the rubble of the stone Buddhas in the Hindu Kush mountains that his Taliban friends blasted to smitherenes in 2001. Atheists naturally assume that his story has now played out, full stop. "So why talk about Bin Laden resurrecting?" You may ask. "Does someone claim to have seen that murderous old reprobate again?" Putting your response intemperately like that introduces two questions about any historical event. First, what is the evidence for it? And second, how plausible is it in the abstract? Given our "universal" experience of death, is resurrection even possible? And even if someone were to claim to see Osama bin Laden alive again, doesn't his character make him one of the last people on earth for whom God would do special favors? Which raises yet another question: if Osama is the last person, who would be the first? McGrew, for instance, argues that the purely historical evidence for the resurrection is overwhelming. He makes a case that if the prior probability (2) of the resurrection is only one in 10^40, the historical evidence (1) is so good that it is still 10,000 to one that Jesus really did rise from the dead. Skeptics have exuded much greenhouse gas scoffing at the huge probability McGrew gives for (1), the resurrection. And I admit it seems unlikely that ancient historical evidence could really rise to that level. One skeptical philosopher has apparently claimed that there is a one in four chance that some sort of "brain in the vat" scenario is true, and we are all living in some sort of computer simulation (or at least he is). I don't buy that, either. But even if there is a one in ten thousand chance the world is unreal, obviously the ancient world is, well, history too. But my main focus was on (2), the prior plausibility of the resurrection. In that case, I scoffed at high a priori odds against Jesus rising from the dead. In fact, I argued that the prior probability is so good, that the overall odds of the resurrection may be even higher than McGrew concluded. A skeptic named Xtian (Ex Christian?) was among those who challenged my arguments. In the rest of this post, I'll use the timely demise of Osama bin Laden to further illustrate four points, then respond to some of Xtian's challenges. I. Might God play favorites when it comes to resurrections? We can answer that question easily by asking another: what would happen if Osama bin Laden came back from the dead? "Spirit of God, pray that God would restore me to earthly life." Bin Laden's followers no doubt assume he is now enjoying all the sensual thrills of heaven. But were he restored to life, God's dramatic act on his behalf would no doubt prove a shot in the arm to the radical Islamicist cause. Recruitment to Al Quaeda would go through the roof. A new caliphate might be quickly form. The infidel nations might soon be gathered into the House of Peace. 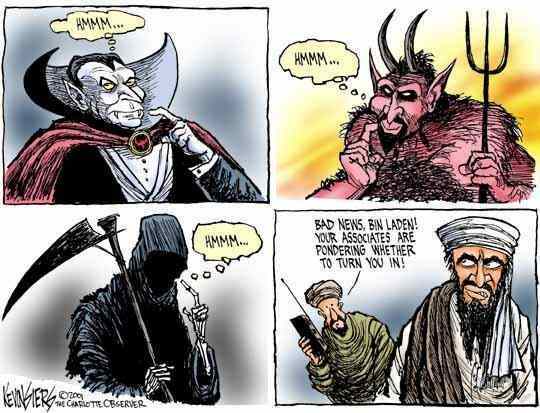 On the other hand, those of us who doubt Islam is true, let alone radical Islam, see Osama bin Laden as rather less likely to enjoy God's mercy than, say, the anonymous skull in the desert. Perhaps God might raise Osama so as to allow him to repent, and warn humanity of the terrors of hell. But it would seem unfair to give Osama a second chance, before millions of lesser sinners. It would look like rewarding bad behavior. Intuitively, it seems that if God exists (and skeptics, please hold onto that question for later), and if resurrection is possible, it is more likely that God would set aside the law of Entropy on behalf of some people, than others. II. What factors favor the resurrection of Jesus a priori? (a) Virtue. A Newsweek poll found that most Americans agree that the world is a more charitable place because of the life of Jesus. I and others have made that argument historically in many places. (b) The nature of Jesus' sacrifice. Socrates prophecied that the best man would die a violent death: "He shall be scourged, tortured, bound, his eyes burnt out, and at last, after suffering every evil, shall be impaled or crucified." Were this to come true (as it did in the death of Jesus), if God is just, would not such a person not be the most likely to be vindicated by His intervention? (d) Jesus is also posited to have a special relationship to God, the father, which makes his resurrection much more likely. (e) I argued that many prophecies, not only in Jewish but in world cultures, seem somehow to point to Jesus as a world Savior. Some of those prophecies, like Isaiah 52-53, speak of God rescuing the savior from death, or bringing him back to life, somehow. (f) Affirmation of teachings. The Christian view is that the resurrection was not arbitrary, but was the "first fruits" of a general counter-offensive by God in this world against entropy, oppression, and untruth. Now of course you may find some of these reasons more plausible at first than others. But the point is, they all center on Jesus, and show why (for instance) one can't simply say, as some skeptics have, "110 billion people have lived, and no one else has resurrected. So the odds against Jesus rising are at least 110 billion to one." Even the date on today's newspaper, reminds us that Jesus plays a pivotal role in human history. III. Is there a Muslim case for Jesus' resurrection? The Qur'an calls Jesus the "Breath of God," which is where the person who told the story about the skull in the desert got the term. It also calls him the "Messiah." Even from Muslim presuppositions, then, wouldn't God be more likely to resurrect the "Messiah" and "Breath of God," (uniquely called that) than bin Laden, or an anonymous skull in the desert? Especially if God is (as Muslims believe) prone to answer his prayers? What historical personage might God be more likely to affirm supernaturally, on Muslim assumptions? Possibly Mohammed. But even on Islamic grounds, Jesus would stand close to the front of the line. IV. "But you're begging the question about God! We don't believe in Him, so the resurrection is off the table." (a) The existence of God can be taken in two ways in this equation: as a constant, to determine the likelihood of the resurrection, or as the variable we are trying to solve. In my earlier post, I took the latter course, and arbitrarily assigned that probability as one in five. I thought I was being pretty generous to skeptics, here, since probably most of humanity believes in God, for what I at least see as pretty good reasons. Anyway, surely the chance that God exists is higher than the chance that nothing does. (b) But we can also take the existence of God here as the variable to be solved. The resurrection of Jesus is, in part, a function of whether or not God exists. So if you put that question to one side of the equation, the other evidence for the resurrection -- including a priori evidence -- can be weighed against it. If there is good evidence for the resurrection -- and people like McGrew, Craig, Wright and Habermas have I think shown that there is -- and if prior probability is also high, as I argue it is, then all that gives us a pretty good reason to believe God is real. (a) You say IF God exists and IF he wants to communicate moral truths to humanity, then it's PLAUSIBLE that raising a great moral leader from the dead might be ONE of the ways he would communicate this. Each of those "if"s demand an explanation and cannot simply be assumed. If a god exists, why would he care about humanity at all? I don't just assume any of these points. In a sense, the existence of God can be the X, here. I'm giving heuristic values to the other variables to try to "solve for X." If these other claims are even remotely plausible, given the McGrew's strong historical argument for the resurrection, and given the additional arguments I add in the second part of my earlier blog, then the resurrection becomes strongly probable. Many of the tribes around the world that recognize the existence of a Supreme God, recognize that He cares about humanity. Often they pray to Him as "Father," sometimes as "Mother." Furthermore, human beings do feel that God has communicated moral truths to us, in different ways -- through our conscience, culture, prophets. So I'd say this assumption is quite plausible. Again, it doesn't even have to be more probable than not, for my argument to work. (b) Jews have had (Messianic) prophecies for much longer than Christians and the overwhelming majority do not see Jesus as fulfulling them in the slightest. But of course, you must assume that YOUR particular Christian interpretation of the Old Testament is the correct one to prove the case that Jesus was that "Great Person" God would raise from the dead to teach humanity. Actually, a large percentage of Jews probably did convert to Christianity, as Rodney Stark argues in The Rise of Christianity. And such brilliant thinkers as Blaise Pascal found them highly convincing -- as do I. The texts say what they say. It's just a fact that the Suffering Servant in Isaiah 52-53 seems to be given life after suffering death for the "sheep" who have "gone astray." One can choose to not see that, or to not see the many other prophetic types and promises in the OT which Jesus fulfills. The way Christians have often treated Jews doesn't help: Elie Wiesel, for example, accusing Jews for Jesus of betraying Jewish tradition, which is a pretty heavy burden to bare, in light of the Holocaust. But such social considerations don't erase the prophesies from the text of the Old Testament. (c) Your sixth point highlights some very vague parallels between Ancient Eastern writings and Jesus, but again, why do you assume that one must look at these writings through Christian eyes? Couldn't it be PLAUSIBLE that the Judeo-Christian myths are merely echoes of the true religion of Taoism? The parallels aren't "vague," though I didn't give too many details. In the oldest Indian scriptures, the creator, Prajapati, dies for the salvation of humanity. There are some remarkable parallels in these texts, that the 19th Century Indian thinker Banarjea developed. The Chinese philosopher Yuan Zhiming similiarly describe some remarkable parallels between the Messianic Sage in the great ancient Chinese texts, including the Dao Dejing, and Jesus. Maybe I'll post some of this material in a later blog. But these are not historical records; they don't even pretend to focus on any real-world event. So it is impossible that Christianity "echoes" what it actually brings into historical focus. Jesus does what Lao Zi talks about: that makes his position as the focus of God's action in the world more plausible. That is part of what the word "fulfill" means. (d) (You quote) Lin Yutang and other Chinese philosophers as saying "no man has taught as Jesus taught." So what? No man taught like my high school English teacher taught, but I don't think he was raised from the dead. I guess you understand what he means, here, and are scatting to save yourself the trouble of dealing with it seriously. Lin meant that Jesus was the greatest teacher who ever lived. He also borrowed an ancient Chinese saying, "Blow out the candles: the sun has risen." Is that how you feel about your old teacher? If so, are you sure he didn't rise from the dead? (e) God doing what you suggest could be anything to fit your pre-conceived ideology. I can posit that IF the Flying Spaghetti Monster exists, and IF he has the ability to turn people into millionaires, then we can believe it is PLAUSIBLE he has turned people into millionaires. Given the right conditions for your god, ANYTHING can be plausible. It doesn't mean such things actually happened. Now you're just being silly. God is not a monster in space invented by skeptics to mock religion. Defeating death, affirming virtue, and putting tyrants on notice are hardly arbitrary values. And there's plenty of evidence that it "actually happened." (f) Then comes the second part of your essay, in which you provide historical evidence for the resurrection. And the evidence is...1 Corintians 15 and the fact that there are a lot of Christians. Really? Why don't we have any writings from these 500 "witnesses"? Who says we don't? The author of the Gospel of John was probably a witness. Mark was probably a witness. Paul was certainly a witness. But I mentioned several other pieces of evidence, which I encourage other readers to look over more carefully, and with a more open mind, than you seem to have done so far. (g) How do you know James and the apostles weren't delusional or merely had an vision of a bright light like the Apostle Paul? People don't all have the same delusions. Bright lights don't have meals with their friends. People don't go to the cross to testify to seeing fireflies or swamp gas. But these are standard apologetic issues, that are well answered by conventional apologists, and are not really the focus of these two blogs. (h) Then you refer to other people's books as well as the disputed claim by Habermas that "most scholars admit the tomb was empty," without mentioning that most of the scholars surveyed were already evangelical Christians. I'm just summarizing the McGrew's argument here, very briefly. I don't know why you focus on a single tangential phrase describing someone else's argument, rather than my own. Also, what's your source for whom Habermas surveyed? (i) Just because 1st century Palestinians knew what happens to a decaying corpse doesn't mean they "were perfectly aware of the 'facts' of nature." They knew nothing about bacteria and other microbes, otherwise they would've got rid of smallpox a lot earlier. Supernatural explanations were common and resurrection stories were all over the place before Jesus (Osiris and Dionysus, for example). "Plutarch recounts one version of the myth in which Set (Osiris' brother), along with the Queen of Ethiopia, conspired with 72 accomplices to plot the assassination of Osiris. Set fooled Osiris into getting into a box, which Set then shut, sealed with lead, and threw into the Nile . . . Osiris' wife, Isis, searched for his remains until she finally found him embedded in a tree trunk, which was holding up the roof of a palace in Byblos on the Phoenician coast. She managed to remove the coffin and open it, but Osiris was already dead. In one version of the myth, she used a spell learned from her father and brought him back to life so he could impregnate her. Afterwards he died again and she hid his body in the desert. Months later, she gave birth to Horus. While she raised Horus, Set was hunting one night and came across the body of Osiris. Enraged, he tore the body into fourteen pieces and scattered them throughout the land. Isis gathered up all the parts of the body, less the phallus (which was eaten by a fish) and bandaged them together for a proper burial. The gods were impressed by the devotion of Isis and resurrected Osiris as the god of the underworld." This obviously much less resembles the resurrection of Jesus, than does the "resurrection" of Lois Lane in Superman. The ancients knew the "facts of nature" in the relevant sense. This is why the Athenians scoffed at Paul when he spoke of Jesus' resurrection at Mars Hill: the forum was founded on the assertion that, as Apollo is said to have noted at a ancient trial there (involving murders in the highly disfunctional family of Agamemnon, after the Trojan War): "When a man dies, the earth drinks up his blood. There is no resurrection." This is also why Jesus' own disciples were so incredulous when they first heard the news. Whatever stories people like to tell over campfires, in the 1st Century, they had all had intimate first-hand experience of death and decay -- they were fishermen, for one thing. (j) I can believe that World War II happened because there's plenty of documentation from thousands of independent eyewitnesses, not to mention audio and video recordings. Evidence for Jesus' resurrection (your blog notwithstanding) currently stands at nil. That looks like naked assertion, in the face of contrary facts. In ordinary circumstances, as McGrew and others show, any event supported by evidence as strong as that for the resurrection, would be universally accepted as almost certainly true. I should have said "almost all," which is certifiably the case. I was being too cautious. (l) I have not read your book, "Why the Jesus Seminar Can't Find Jesus, and Grandma Marshall Could," so I can't comment on your 50 characteristics. However, since this "historical DNA" seems to me to be so pivotal to your arguments, I wonder why you couldn't at least fill me in on what some of those characteristics are. I understand you have to sell books, and I'm not asking for a complete run-down of your book, but couldn't you tell me just ONE characteristic to support the historical truthfulness of the Gospels (besides the ones listed in this particular blog post)? Thanks for asking that way. Fortunately, I did exactly that in March, focusing on just one of those 50 characteristics and showing why it is historically persuasive -- here's the link. (m) Again, you refer to other scholars in this field for the "outstanding" evidence but you don't mention exactly what pieces of evidence you find so convincing. Since you have not given any other specific information, I must conclude that you do not have this evidence or you know who has it but don't know what it is. Perhaps you will add more to this post, but I find nothing here that hasn't already been addressed by myself or other commenters on this blog. Please don't too quickly assume that. I often bite off more than I can chew. This isn't my full-time job, you know. In my on-line personna, I try to be careful in my claims -- I can almost always back them up, if I need to, and in some cases have written extensively on them elsewhere. But I don't feel guilty about making claims without proving each and every point, or even giving all the details. Time is limitted. Arguments from silence are seldom valid, certainly not in this case. Some of my points are, I think, indisputable. But I've tried to make it clear that what I'm NOT trying to do is offer a definitive historical argument for the Gospel, here. Others have done a much more thorough job of that, and I encourage people to read their arguments, along of course with my Jesus Seminar case for the Gospels. But what is needed more than anything, for any argument to be persuasive, is an open mind, willing if not to be immediately persuaded, at least to take in the good arguments, give them due weight, and keep your eyes open for further evidence. I hope you'll do that. How can you doubt that Islam is true, when you just spent two weeks arguing that the God of Islam and the God of Christianity are the same being? First off, a minor point: My screen name is actually Extian, with an emphasis on the EX. And thanks for honoring me with such an official response. I'll address each of your responses to my objections. (A) Even if we allow God's existence to be an unknown value (X), you cannot solve for X without knowing what the other heuristic values are. Wild estimates have been tossed around as probabilities for a resurrection (1:10,000, 1:1,000,000,000, etc. ), but the reality is that neither you nor I nor anyone else can really give a remotely close estimate of these probabilities because we don't have access to all the relevant factors across human history (unless you're omniscient). The values you plug in to solve for X will be essentially arbitrary, and the equation will be meaningless. I haven't finished reading McGrew's article, but the little I have read does not indicate that he has a reliable method for determining these factors either. (B) You have no proof that a "large percentage of Jews probably did convert to Christianity." No doubt some have, but even if it was a "large percentage," it doesn't mean Jesus actually fulfilled the OT prophecies. (C) Why should I care about what Lao Zi says, or whether he talks about Jesus? How does the Jesus-Eastern philosophers parallel make Jesus' "position as the focus of God's action in the world more plausible"? That is a non-sequitur. And the parallels you listed are still very vague. (D) This is similar to my point in (C). Just because some Chinese philosophers thought Jesus was the greatest teacher who ever lived (which isn't in the original quote you posted; saying no man teaches like Jesus is not the same as saying he's the greatest teacher ever, but whatever...) doesn't mean I should believe that, too. Why should I care what Lin Yutang thinks? What does Lin Yutang have to do with God communicating to the world? (E) I didn't bring up FSM to be silly or to mock religion. I did it specifically to show you what your unfounded claims look like to other people. I didn't say defeating death, affirming virtue, and opposing tyrants were arbitrary values; my point was that assigning those values to the Christian god is arbitrary, and they could just as easily be attributed to FSM with no logical contradiction. (F) Do YOU have writings from the 500 witnesses? Because that would be breaking news. The names "John" and "Mark" never appeared with their corresponding documents until the third or fourth century; they were assigned by the Catholic church many years later. We have no evidence that the people who wrote the Gospels were the original disciples or were eyewitness. This is evidenced by the fact that an eyewitness would not have been able to report on solitary moments in Jesus' life. Paul never claims to see a resurrected Jesus in the flesh. In the epistles, Paul speaks of Jesus' revelation in very generic terms, while the specific details in the book of Acts describe a bright light and a loud voice - things which can be hallucinated, and thus, are not sufficient proof of Jesus' physical resurrection. And what do you mean there's "plenty" of evidence the resurrection "actually happened"? I thought the whole point of this blog post was to present said evidence? (G) Actually, studies have shown that when a group of people share a strong cultural, social, or religious foundation, they are susceptible to group hallucinations. When one powerful figure in the group claims to have an experience, he/she can induce hallucinations by suggestion in others of the group. This is documented in a report published in "Hallucinations: Behavior, Experience, and Theory" in 1975. In terms of bright lights having meals with their friends, it depends on how strongly you believe in the existence of lights capable of eating. People can make themselves believe ANYTHING if they truly want to. (I) One single quote from Apollo doesn't mean that no one in the ancient Roman world believed in the resurrection. Many people at the time believed the Egyptian myths (like Osiris's) and wouldn't have found the resurrection that odd. But even if no one believed in a resurrection in the 1st century, they still believed in all sorts of supernatural things. This is evidenced by the context of Paul's Mars Hill sermon - he's in the midst of a vast array of deity statues and objects of worship. The people Paul was talking to already believed in things we'd find improbable, like Zeus or Athena. Even the Epicureans that argued with Paul believed in (neutral) gods. In the 21st century, such an open cornicopia of spirituality in the public square would not be tolerated outside of a church (especially in Europe). This is because people today are LESS likely to accept supernatural events and deities. It does NOT make the disciples more reasonable for accepting an unproven account, any more than it makes us less reasonable for rejecting it. (J) What's "naked assertion" is your claim that the evidence for the resurrection is strong. I've already shown that the Bible is not sufficient evidence (it's anonymous hearsay, which wouldn't pass muster in any court) and the empty tomb is not a proven fact (no matter how many times Habermas says so). I, however, would be happy to provide evidence for my claim that World War II actually happened. (K) I don't think Jesus was at the center of any of the greatest reforms in history because Jesus (if he existed) only lived for 33 years and he caused no great revolutions in his lifetime. Great social, political, and cultural reforms in human history were the result of groups of human beings working together to try to make a better world. If you're going to point to all the good things the Christian church has done (ignoring the bad things, of course) then you need to explain why it is that many non-Christians and secular people have frequently performed the same works of charity as Christians. (L) I haven't read the link you posted, but when I get a chance, I'll try to respond to that one to. I understand your time is limited; mine is too. To your credit, you did post links to other resources, but there are ample ways to provide evidence to support the finer points of your arguments without taking a lot of time. Your statement, "I don't feel guilty about making claims without proving each and every point, or even giving all the details" was very disturbing to me. I'm not asking you to write a 100-page thesis on every single point in a blog comment, but when it comes to the vital points of your argument, I think it is extremely important to provide adequate support for your case instead of just asking your readers to jump to your conclusions. When an argument is in contention or questioned, it may be absolutely necessary to prove "each and every point" to ensure all your readers that you have covered every loose end and are not hiding any presuppositions. We disagree on a lot of points, David, but there's one thing you must know about me: I'm ALWAYS open to evidence and new arguments. I could have dismissed you as another nutty Christian and not taken the time to respond to anything you had to say. But I sincerely wanted to know what evidence you had to offer, and have tried to formulate a serious response in proportion to your points. If you wish to present more evidence to support your arguments I will be more than happy to listen. However, also know that I will criticize and point out flaws if I feel it necessary. You should not take my criticism of your points as "close-mindedness" or "dogmatic atheism"; it's just a disagreement. I present my reasons, and you can criticize those; you present your reasons and I can criticize those. But accusations of close-mindedness do not advance the conversation. Thanks for the exchange; I look forward to reviewing your evidence in the future. Dr. H: I'm cool with "God is great." But I'm not so down on "And Mohammed is his prophet, or we cut your head off and sell your kids into slavery." X: (A) What we can calculate are ranges. If McGrew and I are anything close to correct, of course we can't give exact odds like Spock always does (I suspect McGrew knows that), but we can reasonably conclude that the resurrection probably happened, and therefore that God probably does exist. I think all the issues are probably clear enough to do that. (C) "Why should I care about what Lao Zi says, or whether he talks about Jesus? How does the Jesus-Eastern philosophers parallel make Jesus' "position as the focus of God's action in the world more plausible"? That is a non-sequitur." I was expecting that objection, because you're right, I didn't make it clear. First of all, it might not make the resurrection of Jesus more plausible to YOU, but it might make it more plausible to Chinese, who value the Dao Dejing. Atheists are not the only ones who count! Secondly, I think it SHOULD make the REZ more plausible to you, because the Gospel is shown to solve more than Jewish cultural problems. A good modern map of the world should show all six continents. If the Gospel helps us understand the world, it should help us understand all traditions better. Third, one can plausibly make the case that the life, death, and resurection of Jesus is foreshadowed in many cultures. This makes it vastly more plausible that God, having spread such promises around, would bring them to fruition by raising Jesus (as opposed to someone who does not fulfill those prophesies) from the dead. (D) Why should you care what Lin Yutang thinks? The answer should be obvious by now. The question here is the prior probability that Jesus, as opposed to Joe Schmo, would rise from the dead. Lin Yutang was a great judge of sageliness. If someone of the status of Lin thinks Jesus' teachings far outshine those of even the greatest Indian and Chinese philosophers, of course he is far more credible as the object of God's divine action, for all the reasons I've given. But I fear I'm starting to repeat myself. (E) Sorry, but your spaghetti monster remains an unserious response to a serious argument, and I think you know it as well as I do. I've given some of the reasons, but I think you know them already -- this is the kind of discourse that only sounds interesting among sophomoric skeptics, of whom there are many. DM: "I'm cool with "God is great." But I'm not so down on "And Mohammed is his prophet, or we cut your head off and sell your kids into slavery." And it says that in the Koran... where? "Good question. Several responses: 1) I surveyed the entire field, theological left as well as right. That's all anyone can do. 2) A number of non-evangelicals & even skeptics accept the historicity of the ET, as well, and I have footnoted many of them. 3) No matter where the "head count" is, a critic has to answer the args favoring the ET, of which I have found just short of two dozen in the literature!" (F) Actually, we do have both internal and external evidence that Mark and John came from early disciples of Jesus, and that Luke came from friends of such disciples. The power of those testimonies is the subject of my Jesus Seminar book: but it's interesting that even members of the Jesus Seminar admit quite a bit of the Gospels, when it doesn't conflict with their worldviews. Paul's mention of the 500 is also hard to explain on the assumption that his vision of Jesus was just a private hallucination. (G) "People can make themselves believe ANYTHING if they truly want to." Yes, I've noticed that. But perhaps, if you have the book, you can cite the passage you feel most strongly makes the case that large groups of people can easily hallucinate the resurrection of their closest friend? Because that's not something I find easy to believe. If true, we may have to toss a whole lot of history in the rubbish bin. (H) I have more respect for Gary Habermas, and frankly for you, than for Richard Carrier. Habermas explains a bit more above. (I) Of course people in the ancient world believed in the supernatural: so do most of them today, for good reason. But Osiris was a god in a myth, not a human being. There's plenty of evidence, both in the NT and out, that the ancients were in fact skeptical about claims for a resurrection: Wright discusses this issue quite a bit, as I recall. And I didn't just give "one single quote," either. (J) I've given SOME evidence for the resurrection, which you've asserted was actually "nil." Since the evidence I gave still stands -- and since, in fact, several early sources that have been found accurate on many other matters describe the resurrection - it is patently untrue to say there is "no evidence." Obviously I'm not going to give you all the evidence I find for the general reliability of the Gospels, nor do I think you expect me to. But even radical skeptics like Funk and Crossan admit the Gospels tell us a lot that is historically true about Jesus. They also make it clear that they reject the miraculous part because they don't believe in miracles. Obviously, the agreement of several reports that get such minute details as what Jesus said, about so momentous an event as the resurrection, is evidence -- even if you reject it for a priori reasons, as do Funk and Crossan. You really ought to be able to admit that -- it's not a huge concession, but it would show me that you're serious about this. Yikes! Thanks for catching that. Now this is just bad. I found this blog on a discussion about the philosophy of religion, but what I've found instead is more than a little bit inadequate. I get the sense that you're new at this, so I'll confine myself to talking about your list of "reasons" to "favor the resurrection of Jesus a priori:"
a. Virtue. Your point here is a non sequiter. It does not follow from most Americans claiming to think in a study that the world is more charitable because of the life of Jesus that the world actually is more charitable because of the life of Jesus, but even if it did, from that would follow neither that, a priori, we have reasons to believe that Jesus was raised from the dead by God, or that Jesus's being raised from the dead by God is not a priori impossible. b. The nature of Jesus' sacrifice. Just because Socrates says so doesn't make it so. But the point is bad enough that even if it did, it would not follow from "Jesus was the best man" that "Jesus was raised from the dead by God." It begs the question in favor of the conclusion you are trying to reach if you assume that, the better a man's life is thought to be, the more likely it is he would be resurrected by God. It would also not follow from "Jesus was the best man" that he would be most likely to be vindicated by God's intervention, given that, unless we beg the question in favor of the conclusion we are trying to reach, you have given us no reasons whatsoever to think that God raises anybody from the dead- and if he did, why go with the "best" person? And isn't it true that in mainstream Christian theology, God plans to resurrect everyone at the last judgment? As such, on your own doctrine, there is no entailment between someone's being "the best" and their being resurrected by God. c. Resurrection also rebukes the forces that murder unjustly. Wrong, it tells them that there are no consequences to murdering some people because those people just get resurrected anyway. There is no indication in Biblical mythology that Pontius Pilate died anything but a happy, successful old man, and if this is God's rebuke then it was pitifully ineffective because unjust government was just getting started in the time when Christ is rumored to have lived. d. Jesus is posited to have a special relationship with the father. It does not follow from this being posited that it is the case- it is your job to make that case, not assume its presence in a premise from which you mean to infer a critical fact of that case! e. Prophecies. Given that some of those prophecies say things like "the Son of Man is a worm," which is inconsistent with the hypothesis of plenary inspiration but is totally consistent with the hypothesis that the New Testament was written with retrodiction in mind, you have provided a point that conspires against your position. f. Affirmation of teachings. If we construe the resurrection of Jesus as the "first fruits" of a battle against "entropy, oppression, and untruth," then probably either God is not omnipotent or the resurrection did not occur. Given that entropy has been necessarily increasing universally since the day of the mythological resurrection, God has abjectly failed on this front. In the absence of any objective measures (good luck finding one that favors your position), you could never argue successfully that "oppression" and "untruth" have been on the decline since the time of the resurrection or that the resurrection caused either of those things to decrease, rather than increase, or be unaffected. There are many very basic, introductory concepts in logic that you are missing here. This is a mockery of some of the philosophical rigor that the theistic position actually has to its credit. I strongly recommend that you clean up this embarrassment. Christopher: I hate to break it to you, but despite your patronizing tone, you don't appear to be accurately following much of the argument. (a) Of course it is more likely that if God exists, he would reward a uniquely virtuous person than an average person or a bad person. My argument at this point is NOT that we have "a priori reasons to believe that Jesus WAS raised from the dead," but that God is a priori more likely to raise Jesus than the average Joe. Since you came from a philosophy site, I hope you recognize the difference. (b) I've already explained "why go with the best man," as did Socrates. The fact that this logic is recognized by some of the wisest humans who have ever lived, not just in Christian culture, ought to give you pause. If you fail to recognize it -- you ought to ask yourself: might I have missed something? Why did Socrates see this, and I don't? Should I just assume I know how things work better than the greatest philosopher in the Western world? (c) This is just silly. Pilate may have died old and happy, but the resurrection helped billions of people to better recognize the immorality of unconstrained power. (e) You're being obtuse, and selective in your reading. I didn't say the resurrection ended entropy. I said it was the "first fruits" of a counter-offensive against "entropy, oppression and untruth." The Biblical image is a tree that grows slowly from a seed, not a magic wand th0at changes everything instantly. A strong case can be made that the Gospel has in fact made a radical change in the world for the better on the second and third fronts. Resurrection, and the creative good works that the Gospel has done, are not the completion of the redemptive task, but a sign that God is doing that task in the world through Jesus. I've noticed that a patronizing tone and a failure to accurately read and understand that which one looks down one's nose at, often go together. Marshall, you keep going on about people dying for their belief in Jesus' resurrection as evidence of that resurrection. My challenge to you is to name one such example in which someone is a) in a position to know about it directly (is not having a "vision" a la Paul) b) is persecuted because of it c) is offered the possibility of recanting in order to save their life and d) does not take it and is killed for it, but most importantly e) there must be good evidence for it. In multiple posts, you take this for granted--but no post on your site establishes it, and in my estimation there is no good evidence that any account of any person meets this criteria. If us atheists are really so irrational as you claim, this should be easy. You have written about everything but this claim you see as central to establish the resurrection, so if you're going to confront atheists as often as you do it seems only appropriate for this site. Otherwise I can only conclude you also believe the Mothership is hiding on the other side of Halley's comet, since people have died for that belief as well.